Light Painting Pas de Deux, photo by Harold Davis. View this image larger. Painting with light is a great deal of fun. You can do it anywhere. A darkened room will work, as will the night itself. These two shots were taken at a recent night photo workshop I gave on Point Reyes. Improvisation is the key. 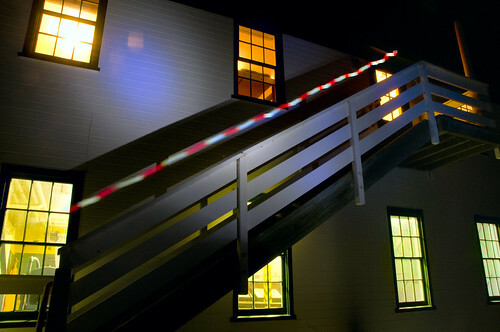 The lights along the fence above was created by a slow dance with two performers and two colored lights; the striped light coming down the stairs (below) was a flashing iPhone. Guiding Light, photo by Harold Davis. View this image larger. 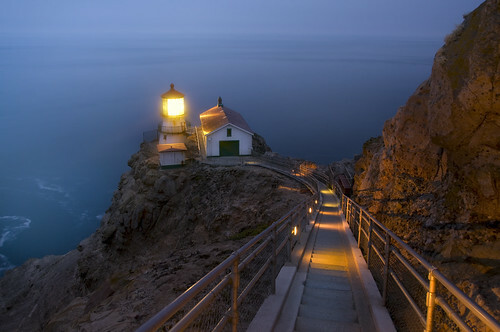 The Point Reyes Lighthouse is one of my favorite night photography subjects. This was shot during a recent workshop I gave with Point Reyes Field Seminars. I’m lucky that each of my night photo workshops has been allowed down the steps to the lighthouse, although the weather hasn’t always been the greatest! Here are a couple of my all time favorite Point Reyes Lighthouse images: Night at Point Reyes Lighthouse and Edge of Night. Dahlia in Decay, photo by Harold Davis. View this image larger. Like people, flowers are beautiful even when imperfect. Perhaps particularly when they are imperfect. If you search for a perfect version of a flower or a person, then you substitute shallowness and ephemeral beauty for true depth. Here’s the story of how I came to first photograph this White Dahlia, and a second version, Ghost Flower. The flower you see here is several days older than the earlier versions. Resurrection is an earlier take on the same theme, involving poppies rather than a Dahlia. 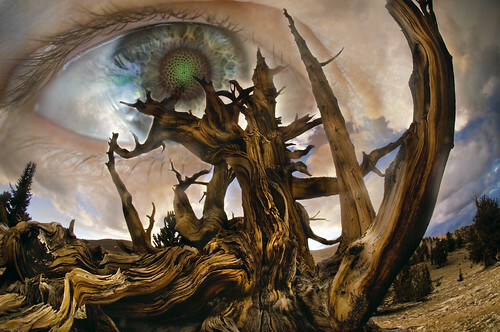 Eye of Wonder, photo by Harold Davis. View this image larger. Before leaving my computer behind for several weeks I needed a Photoshop fix—to hold me away from my beloved until I return. I will miss the family too. 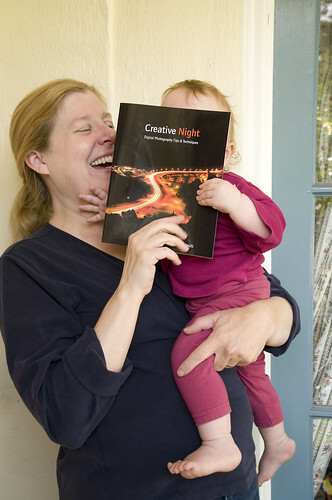 Creative Night Advance Copy, photo by Harold Davis. As usual, Katie Rose gets the first crack at the advance copy of our new book. She’s shown here looking at the back cover of Creative Night: Digital Photography Tips and Techniques. Phyllis, my partner in life and book-creating crime, looks on in amusement. Other advance copy shots: Katie tries to eat Creative Composition; Katie considers the case studies in The Photoshop Darkroom. Read the story behind this photo. View this image larger. My bags are packed, I’m ready to go. Well, almost. I’m on a photo shoot for a while. I’m not supposed to tell you where. The line “If I told you, I’d have to kill you” has come up more than once by now. But here’s a hint or two. It’s a country with four letters in its name. The name of the country begins with the letter C. This country was the location of the incident that almost started a third world war. The United States has a trade embargo with this country. Get my drift? I thought so. So not only am I leaving Phyllis to take care of the kids, I will be pretty much out of touch. This means no blog updates. Or at least fewer, I have some stories saved up. Hopefully, the photos I come back with will be worth it. Setting Limits sounds like something parents should do to control their kids. Setting Limits is also my most recent Photo.net article about becoming a more creative photographer. The idea is to set a limit when you feel creatively stuck. 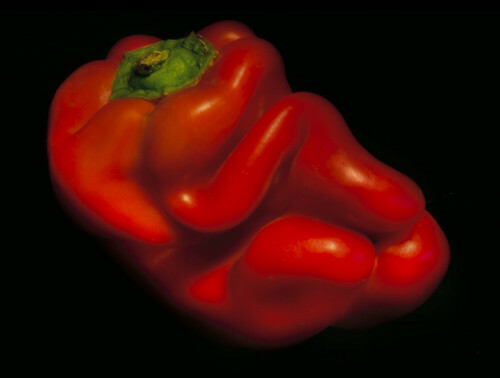 Without limits, the possibilities of what we can photograph are enormous. So if you don’t know what to photograph, I suggest limiting yourself in time, space, subject matter, or technique. At the same time, I explain that you shouldn’t limit yourself without knowing it. Fear that you cannot master a certain technique or that your photo won’t come out is no excuse for not trying and giving it your best. And certainly, you don’t want to slavishly follow some supposed rule. So setting limits requires finesse and balance, like many of the best things in life! Read the entire article on Photo.net. The Photoshop Darkroom: Creative Digital Post-Processing is in stock and shipping. 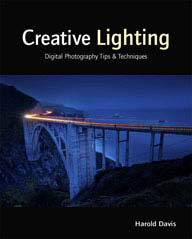 Creative Composition: Digital Photography Tips & Techniques is also in stock and shipping. 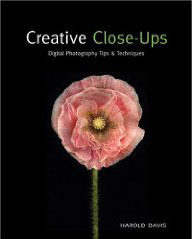 Creative Close-Ups: Digital Photography Tips & Techniques has a November 23, 2009 publication date according to Amazon. 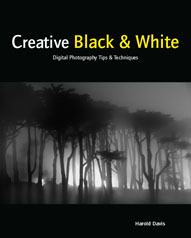 We are also under contract with Wiley Publishing for Creative Black & White: Digital Photography Tips & Techniques, with projected availability in mid 2010. Thanks everyone for your expressions of anticipation and interest in our books. 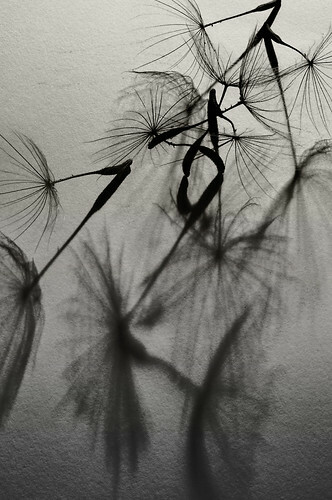 Ghost Flower, photo by Harold Davis. View this image larger. 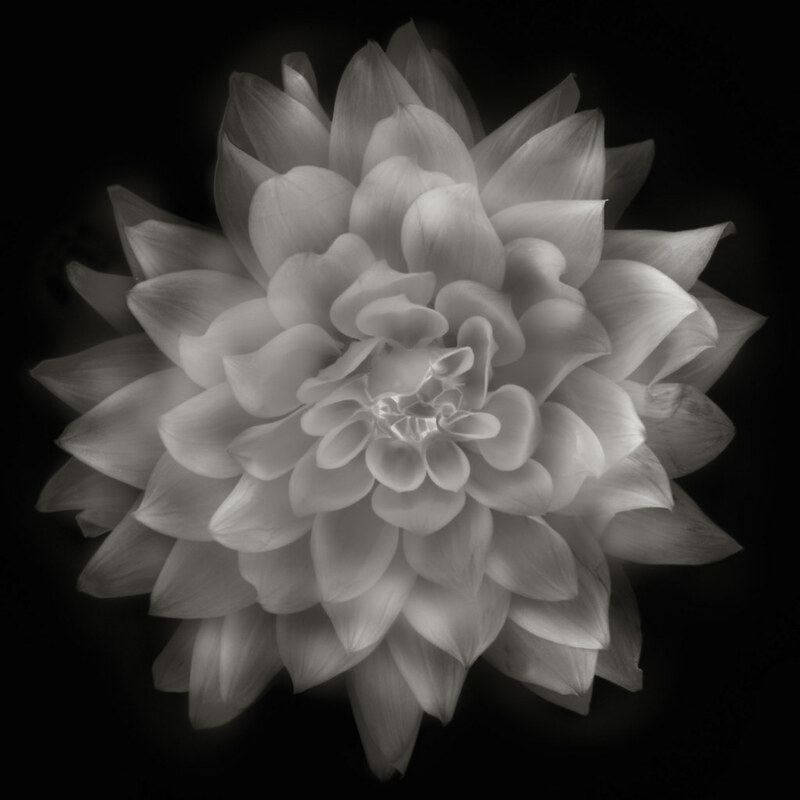 The monochrome White Dahlia came from a color image. A high key color image, and one that didn’t have much in the way of contrasting colors. Which is what made it so ripe for black and white conversion. To create this version, I used duplicate images converted to LAB color, and hit with an Inversion or Equalization adjustment on a specific channel. I then copied the transformed version back over the original, blending in a variety of modes. The whole thing became a stack of 35 layers. Eeek! This process is explained in extremely gory detail in the major case study in the final part of The Photoshop Darkroom: Creative Digital Post-Processing. Julian wandered past my computer at about this point, and I asked him what I should call the image. He suggested my title, “Ghost Flower.” What are kids for if they can’t give you good titles for your work? Just kidding. Like Molly Bloom, my answer is always, “Yes.” I have no shame about using Photoshop, and it is integral to all my images, some more than others. 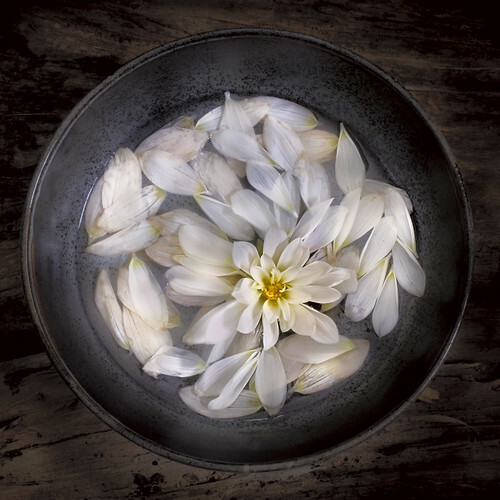 The point of a photo like “Ghost Flower” is the way it looks and the emotions it arouses, not how it was made. Full disclosure: Per the new F.T.C. regulations, I am using Photoshop CS4 for free courtesy of Adobe Software. 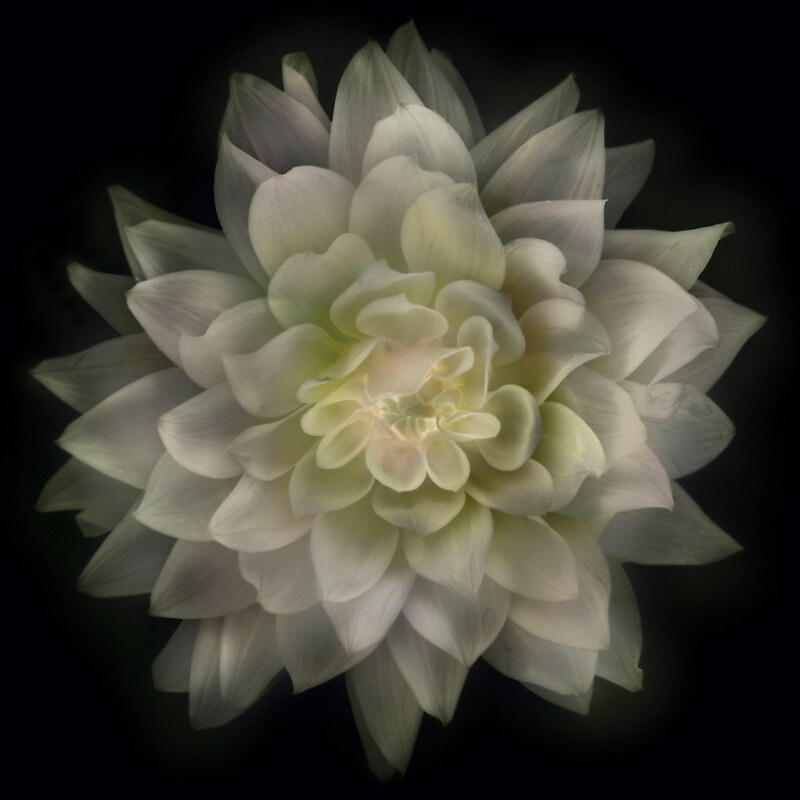 White Dahlia, photo by Harold Davis. View this image larger. I wasn’t planning to photograph any more flowers yesterday. Between kids and work things had been hectic indeed. But when I saw the white Dahlia in a bucket outside a florist, I knew I had to possess its soul. Otherwise known as, photograph the flower. This particular white Dahlia was not perfect. In the sense that it had obvious flaws. But I could deal with these. The flower had a lavish, wild, partially symmetric sensousness that called out to me. I bought the stem for $2.50 from the florist, and I wouldn’t let him doll it up with the kind of ugly decorative grass that florists tend to use across all varieties of flora. Putting lipstick on a pig is an act of futility. It also hurts to diminish something of pure beauty by adding unbecoming and unnecessary decoration. I cut the flower off the stem. Oh, how we hurt the ones we love! Next, I photographed straight down on a light box. For this image I made a total of six exposures using my 85mm macro, all at an adjusted aperture of f/64 and ISO 100. Exposure times ranged from 2 seconds to 30 seconds. The exposures all were “over exposed” by the histogram, and tended towards the high-key on a white background. I combined the captures in Adobe Photoshop CS4 using layers and masks. The inital RAW conversion included 10 layers. After “smooshing” the layers down (now, there’s a technical term for you! ), I converted to the LAB color space. I duplicated the image, and used an inversion of the L channel to create a black background. Then I copied the original image over the L-inverted copy at varying transparencies. This helped to create a soft, semi-transparent effect in the petals. I could see this was an essentially black & white image, so I decided to formally convert to black & white. I used my favorite technique of duplicating the background, using a CS4 b&w adjustment layer, selectively painting in areas, and repeating the process with different b&w adjustment layer settings. The image seemed to need something more, so I duplicated a flattened version, and put it through Nik Software’s Silver Efex Pro. The Silver Efex “Complex Structure” mode added what I was looking for, and I selectively painted areas back over the adjustment layer version using this effect. The final addition of sepia toning at low opacity was accomplished both in Photoshop and using one of the Silver Efex sepia toning effects. Oh yeah, full disclosure: According to the F.T.C. regulations that take effect December 1, I should note that I am using Nik’s Silver Efex Pro as a freebie professional courtesy. While I’m at it, I might as well note that I am using Photoshop CS4 for free thanks to Adobe Software. Echinacea purpurea Hope, photo by Harold Davis. View this image larger. This photo shows a Coneflower, Echinacea purpurea ‘Hope’. This a patented hybrid, with a portion of each sale donated by the wholesale growers to the Susan G. Komen For the Cure, a leading organization in the fight against breast cancer. 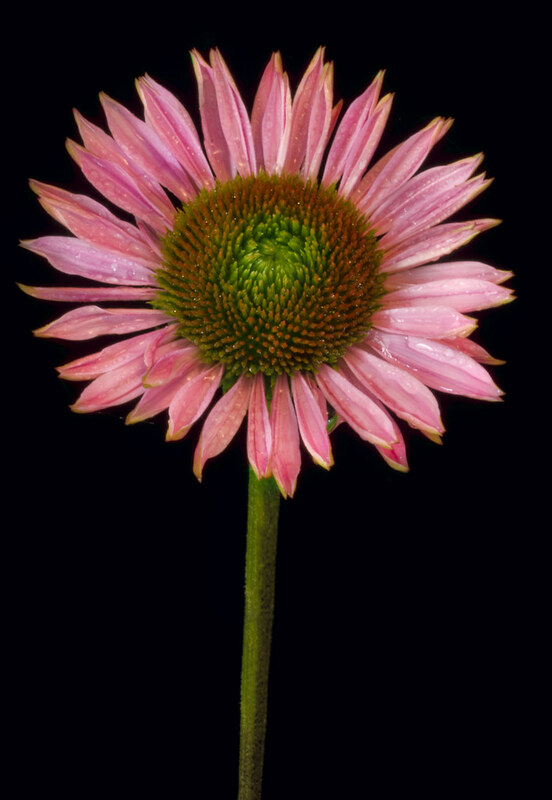 I’ve been growing exotic hybridized Echinacea to photograph. There’s no way you can get these at a florist, so to photograph them I needed to cultivate them. This was one of my first nice specimens, picked just before the onset of autumn rains. I photographed the flower using a black velvet background, and bright but overcast daylight from the front and side. 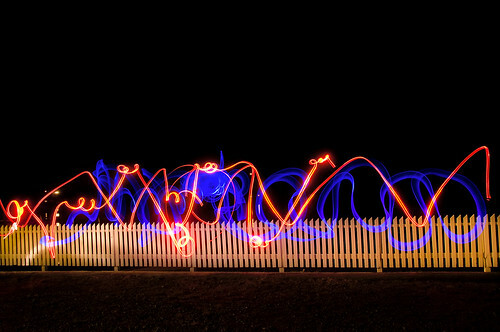 The finished image combines 4 captures at shutter speeds from 6 to 30 seconds. Here’s the full exposure data: Nikon D300, 85mm perspective-correcting macro, 4 exposures (6 seconds, 10 seconds, 20 seconds, 30 seconds) combined in Photoshop, each exposure at f/64 and ISO 100, tripod mounted. Puts me in my place. Poster Cartel is now making available prints of about 100 of my most popular images (including the Nautilus on Black and White shown below). The prints are available on canvas or on Arches Giclee paper in a variety of sizes (roughly from 12X15″ to roughly 26″X40″). The cost per print varies form about $85 to $280, with shipping currently free on orders over $75.00. If you visit the Harold Davis pages on Poster Cartel, you’ll need to click on an image (or on the View All Sizes link) to see all the options that Poster Cartel offers. Read the back story about this image. 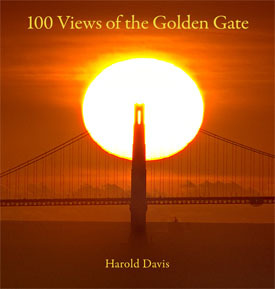 Advance Copy Creative Composition, photo by Harold Davis. In keeping with family tradition, the first look at the advance copy of our new book Creative Composition: Digital Photography Tips & Techniques went to Katie Rose. 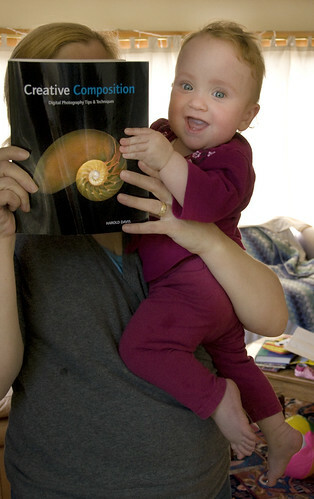 She thinks the book looks good enough to eat. Literally. And I’m delighted with how the book came out. This is very exciting for me. 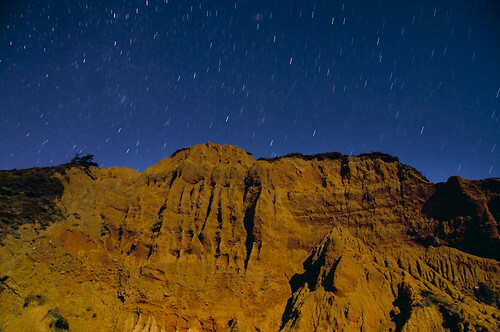 Night Cliff, photo by Harold Davis. View this image larger. Facing the beach I turned around. The night cliffs were lit by moonlight. Sometimes there’s a story behind one, if only one looks. Exposure data: Nikon D300, 18mm, 4 minutes at f/5.0 and ISO 200, tripod mounted. 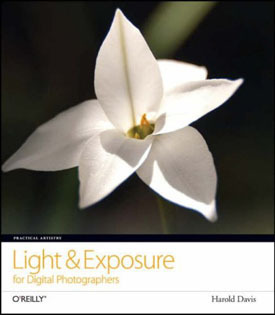 There’s a nice new review by Dominique James in the Sacramento Book Review of my Practical Artistry: Light & Exposure for Digital Photographers. 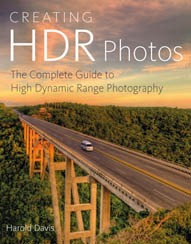 It’s nice to be reviewed by someone who truly understands digital photography, and gets what my book is about. Here’s Dominique James’s mobile phone blog.